W Cosmetic Surgery® is proud to showcase real patient before and after brow lift photos. A drooping brow can leave you looking older and tired. Dr. Allan Wulc can create a customized treatment plan for you to restore your drooping brow, having you looking younger and more natural. Contact us if you are ready to bring your confidence back! 46 year-old woman before and after upper and lower eyelid lift, endoscopic brow lift, laser resurfacing of the lower eyelids, and liposculpture of the tear trough and cheek. 53 year-old woman before and after brow lift, and Micromidfacelift. Additional procedures: upper and lower blepharoplasty, mole removal and laser skin resurfacing of lower eyelids and midcheek festoons. 52 year-old woman with a brow lift. Procedure was accompanied with an upper and lower blepharoplasty and a midface lift. A 69-year-old male shown before and after upper lid blepharoplasty and endoscopic brow lift to restore more youthful eyes and improve vision. 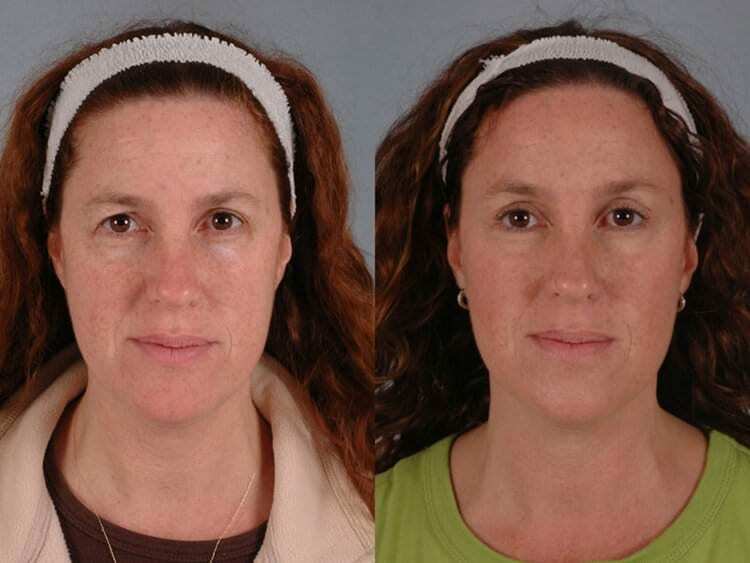 44 year-old woman before and after a browlift, upper and lower blepharoplasty, and laser treatment of the lower eyelid. 43 year-old before and after endoscopic brow lift with upper blepharoplasty. 44 year-old woman before and after droopy lid repair, blepharoplasty, and release of brow protractors. 46 year- old woman before and after endoscopic brow reshaping, upper and lower blepharoplasty, full face laser and Micromidfacelift midface procedure. 49 year-old woman before and after upper and lower blepharoplasty, endoscopic browlift, fat transfer to cheeks and temples, Restylane injection to lips. 50 year-old woman before and after upper and lower blepharoplasty and endoscopic brow lift. 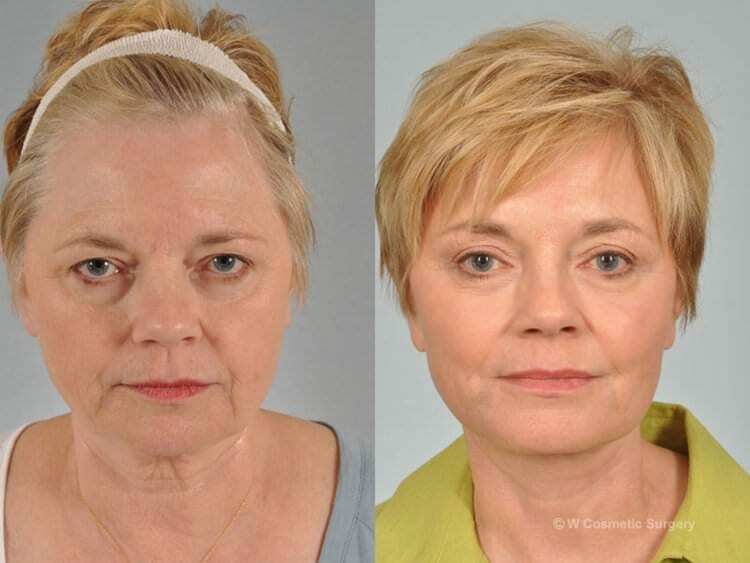 58 year-old woman shown before and after upper blepharoplasty and endoscopic brow reshaping. Additional procedure: laser resurfacing and laser resurfacing around mouth. 62 year-old woman shown before and after endoscopic brow lift and elevation with upper blepharoplasty to deepen the upper eyelid crease. This 63 year-old complained that she looked “sad”. Shown here before and after endoscopic brow lift and reshaping, Micromidfacelift (midface lift with liposculpture), small incision facelift, and RestylaneTM injection to vermilion border. Full face laser micropeel using Sciton dual erbium laser also performed. 65 year-old woman before and after endoscopic browlift . Other procedures: upper and lower blepharoplasty, laser resurfacing lower eyelids, Micromidfacelift (midface lift + liposculpture) procedure, facelift, and neck lift. 69 year-old woman before and after endoscopic brow reshaping with restoration of the upper eyelid crease, Micromidfacelift, upper and lower blepharoplasty. 75 year-old man before and after upper blepharoplasty with endoscopic brow lift. 83 year-old woman before and after upper and lower blepharoplasty, endoscopic brow and midface lift, face and neck lift. 65 year-old woman before and after upper and lower blepharoplasty, endoscopic brow and midface lift, facelift, and neck lift.